Benford, Gregory. Timescape . Pocket 1981. Benford, Gregory. Timescape . Translated to the German as Zeitschaft . Goldmann 1998. What if: John Kennedy was not assassinated. Summary: A University of California physics professor worries about external interference in an experiment as he tries to gain tenure. It turns out that his experiment is receiving tachyon transmissions from 1998 about impending world-wide ecologic disaster. Allohistorical content is brief, appearing only in the final chapters. 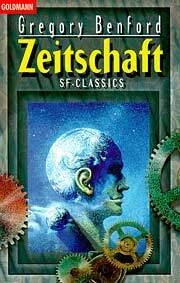 Comments: Benford returns to some of the themes in this novel, and even features discussion of it as a plot point, in Rewrite: Loops in the Timescape . Published: Simon & Schuster 1980 (0671253271BUY); Pocket 1981 (0671506323BUY), 1987 (0671506323BUY); Sphere 1986 (0722116306); Easton 1989; Bantam/Spectra 1992 (0553297090BUY); Gollancz/Vista 1996 (0575600500). Published: Revision of "3:02 P.M., Oxford", in If , September 1970; and "Cambridge, 1:58 A.M.", in Epoch (eds. Robert Silverberg and Roger Elwood), Berkley/Putnam's 1975 (0399114602) and Berkley 1977 (0425033155). Translation: French by Michel Demuth as Un paysage du temps , Denoël 1981 (vol. 1, 2207303322; vol. 2, 2207303330); Gallimard 2001 (2070417727). Translation: German by Bernd W. Holzrichter as Zeitschaft , Möwig 1984 (3811836528), Goldmann 1998 (3442250455). Translation: Italian by Gianluigi Zuddas as Timescape , Nord 1989 (8842903981). Translation: Spanish by Domingo Santos as Cronopaisaje , Ultramar 1984 (8473863518); Ultramar 1991 (8473866657); and Ediciones B 1994 (844064728). Awards: Winner: 1980 Nebula for best novel. Winner: 1980 BSFA Award for best novel. Winner: 1981 John W. Campbell Memorial Award.